Yesterday was very chilly in the morning but it was a gorgeous day for raku! It eventually warmed up a little thank goodness because the students fingers were numb! 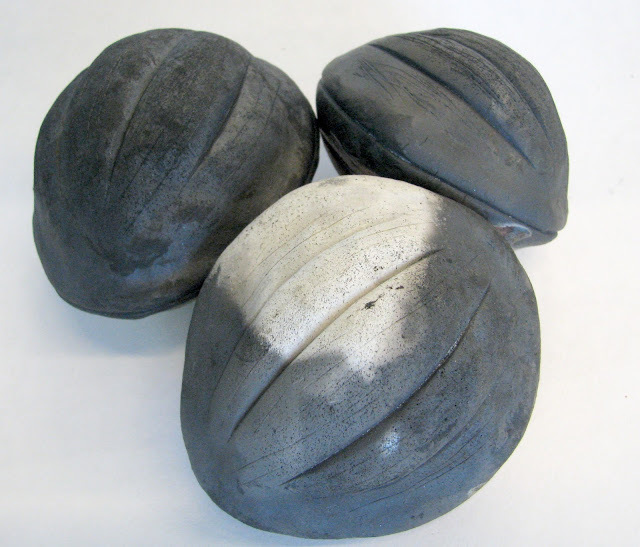 There are actually two sections of ceramics this year so I hope to have another raku workshop in the spring if I can get funding for two. I'd hate for the other ceramics students to miss out on this event. Luckily the kilns were warm so we hung out in front of them like a camp fire. This is the first kiln load we opened with the pots glowing red hot. We put the red hot pottery into garbage cans loaded with paper so it lights on fire. Some of the glazes need to be cooled quickly before they are put into the bins. This one is being sprayed with water so the glaze creates a network of fine cracks. Then when it is put in the garbage cans (aka reduction chamber) the fire starts and then the lid is closed tight. This will cut off the oxygen supply to the fire so it draws oxygen molecules from the clay and glazes. It's called a reduction because of the reduction in the amount of oxygen. 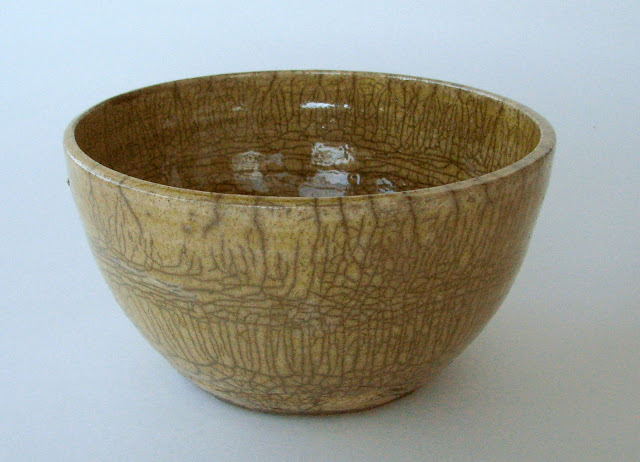 This is horse hair pottery. The pot is taken from the kiln with no glaze on it. Instead strands of horse hair are singed onto the surface of the clay and leave an interesting burned texture of lines. Needless to say it really stinks! But it is really fun to do. 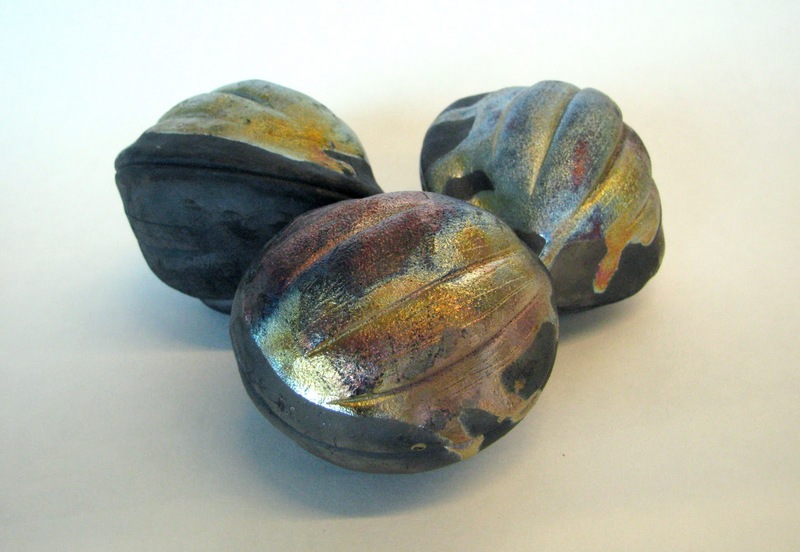 I decided to raku fire a few of my nuts. I just can't resist this one particular glaze. It has a nice matte finish and always turns out beautiful. Yet it looks different every time. On the nuts it turned a beautiful golden color with a bit of coppery magenta flashing on one that you can see on the top. This is the back side of the same nuts without any glaze on them. I couldn't put glaze on the entire piece because the glaze would fuse to the kiln shelf. Normally I'd just leave that part glaze free but because these nuts roll I just glazed one side. I think I almost like this sooty black side better. You can see the white mark on the one in the middle where it didn't reduce properly. But that's part of raku's spontaneous nature! 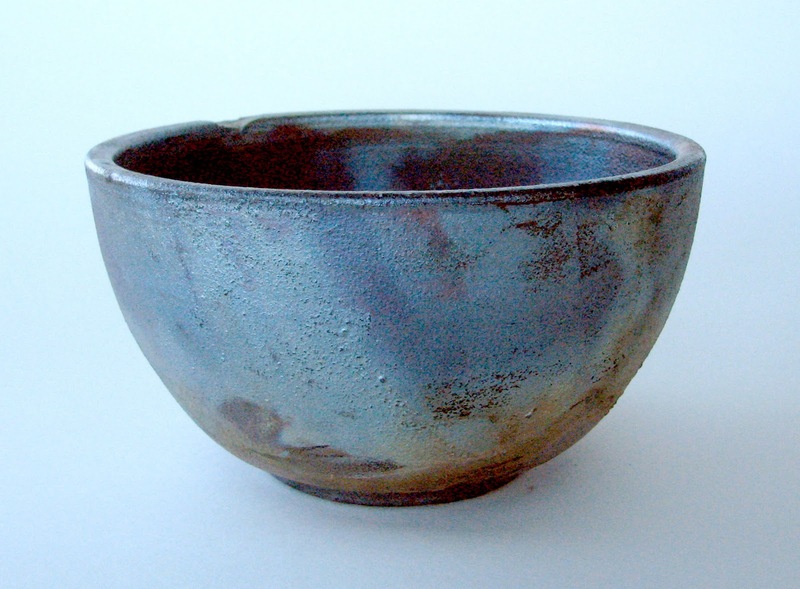 This bowl has a red iron oxide crackle glaze on it that turned a beautiful amber color. ﻿And can you believe this is the same glaze I used on the nuts? It was late in the day so it was hard to photograph but it is a cool silvery blue metallic color. On the right side you can begin to see the great pattern of the flames and crumpled paper right on the surface of the glaze. 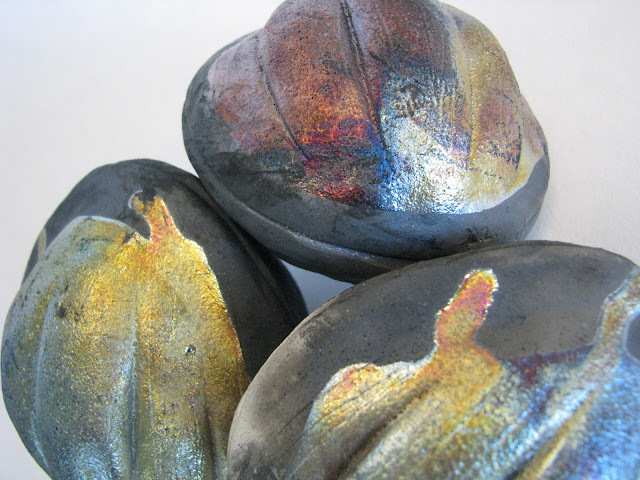 If you ever get the chance to observe or participate in a raku firing I highly recommend it! What an interesting technique! I love the glazed nuts!If you ever come to Greece please bring one and I will buy it!AriadnefromGreece! how exciting! your kids must have loved this.